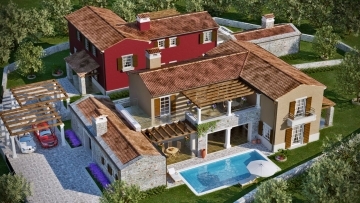 A beautiful villa in the vicinity of Višnjan, surrounded by greenery, 20 km from the sea and the beaches. On the ground floor there is a large open concept living room with kitchen and dining room, two bedrooms with en suite bathrooms, covered terrace and sauna, and on the first floor there are two bedrooms with en suite bathrooms and a terrace. The villa overlooks the South. In front of the villa there is a 50 m2-large swimming pool with salt water, spacious sunshade, storage space and children's playground. The property is surrounded by a stone wall. A great rental property!